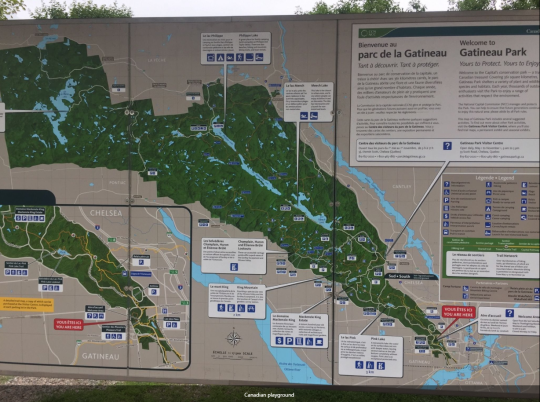 While I was visiting the friends I would be staying with when I did my third triathlon, in addition to scouting that route I also did a ride in Gatineau Park, which is a protected park area just outside of Ottawa, on the Quebec side of the border from Ontario. I guess it would be something akin to a state or national park here in the USA. 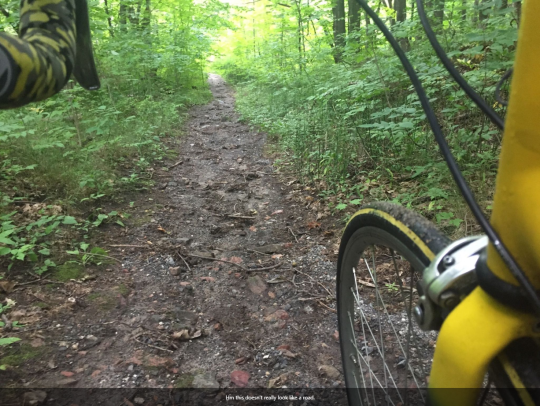 The place is pretty amazing; it’s a huge area that contains 63 lakes and countless miles of trails, including bike lanes, asphalt bike paths and mountain bike trails. 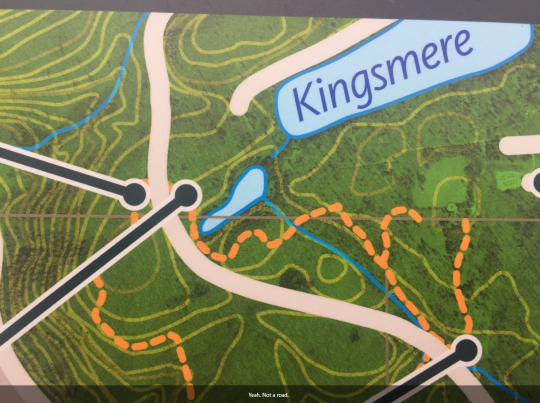 I put Strava’s route builder to the test and found myself what appeared to be a nice figure-8 loop through the lower part of the park, passing by a few lakes and other points of interest. I didn’t have cell service in the wild, so I’d be relying on Strava on my phone entirely to tell me where to go. The entrance to the park was about a half hour’s drive away. I drove for about 25 minutes before I realized I’d forgotten my helmet. I had to turn back, pick it up, and do it all again. That was pretty frustrating, but I tried to put it out of my mind and salvage the day. It wasn’t difficult to do. Gatineau Park is beautiful, and ideally designed for cyclists. There are wide, groomed shoulders almost everywhere, barricaded bike lanes and they even shut down car traffic on Sundays so that bikers can be completely unhindered. Things went great for the first half of the ride. The weather was slightly rainy, but it wasn’t too cold – just enough to keep me cool as I pedaled the climbs. It was a great feeling of being out in unexplored territory (for me), on great cycling terrain where I could just go as I pleased. With my second triathlon coming up on the weekend, I didn’t ride too hard, just got my legs moving and tried to keep things steady. Eventually, the road I was on started to deteriorate. Most of the roads had been in great shape so I wasn’t worried; I was coming up on an intersection with a more major thoroughfare soon, so I figured it would improve. In fact, the road just straight up disappeared. It stopped entirely, at a wall of trees. There was no intersection, just a dead end. I peered ahead carefully and saw that there was a trail, and a thinning in the vegetation that implied that maybe it had once before been a road, at least an unimproved one. I knew I was close to the main road I was headed for, so I decided to walk my bike and check it out. The path developed only slightly into a muddy track. It didn’t look like it was going to get better anytime soon. Sure enough, before long I found myself just standing in the middle of a swampy forest, getting eaten alive by mosquitoes and wondering what the heck to do. I had no cell service so I didn’t know where to go if I were to turn back, except to go exactly the way back that I had come. I didn’t really want to do that; I wanted to see more of the park. 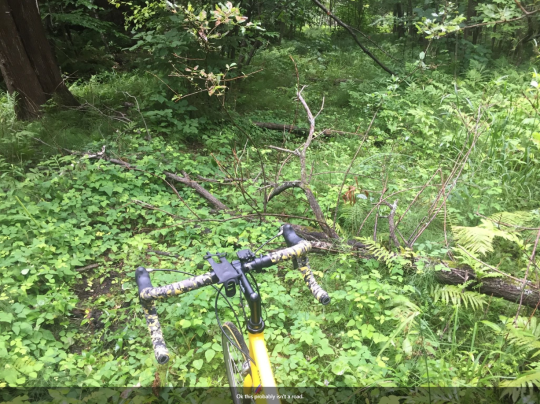 My 23c tires weren’t going to make it through the underbrush though, that much was clear. My phone told me I was really close to the main road, so ultimately I decided to heft my Bianchi onto my shoulder and hoof it the rest of the way. I saw some frogs, splashed through some puddles and climbed over some fallen trees before finally emerging on the clear roadside. My feet were muddy and soaked, but I was satisfied to be back on my route. I rode on, stopping at a place called Pink Lake, which was not pink. It was, in fact, green, and was named Pink after its discoverer, I believe. There was a cool little elevated platform that you could climb up onto to see the view. When I got back to the parking area, I took a closer look at the signboard map and discovered that it did actually show the lack of a road. I guess Strava just skipped over it because it was so close, it assumed it counted as an intersection. It made for a fun diversion, anyway, and a great time discovering a new place to ride. 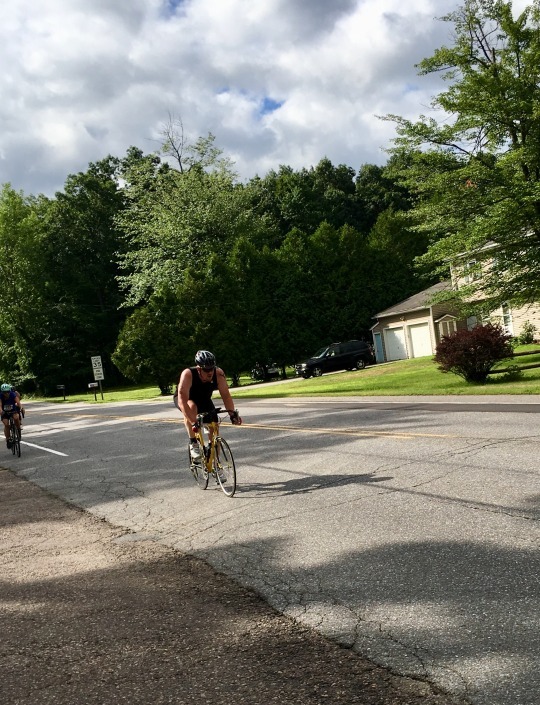 During the brick workout in my recovery week, I had the opportunity to scout the bike route for what would be my third triathlon of the summer. This was the first time I’d been able to preview a race route before the event. It turned out to be flat – very flat. Without a doubt, this was going to be the flattest course out of the three triathlons I’d signed up for. As someone who generally rides a lot of hills, this got my brain working. What would this mean, exactly, for my riding style? I wondered if aero gear would be somewhat of an advantage. I didn’t (and still don’t) have any; I ride a relatively normal road bike with a normal road helmet. 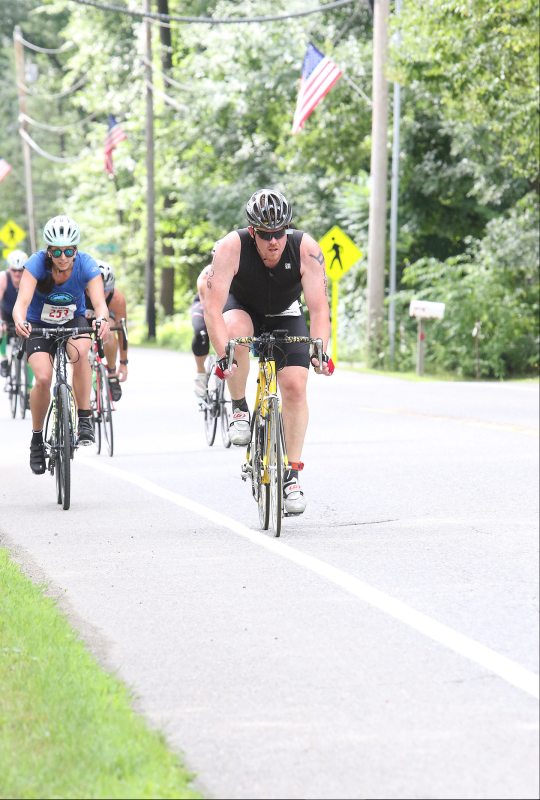 I was still only doing the sprint distance, so I didn’t think it would matter all that much for my own performance if I didn’t have aero bars and an aerodynamic helmet. I could just ride in the drops and hammer. Aero gear would probably only gain me a few seconds over such a relatively short course. The flatness of the course was probably going to be my biggest challenge, I figured. Because I weigh a fair amount, I generally have an advantage on the downhills – I can coast faster than other people can often pedal, and I don’t have to do as much work to do it. That gives me both a speed boost and an opportunity for rest. On a flat course, there wouldn’t be those bonuses. It would just be up to me and my legs to do the work. I felt good about having seen the route, though, and it was a nice ride along the river. After I got back, I went out for a 2 mile run, feeling a bit tired but okay. 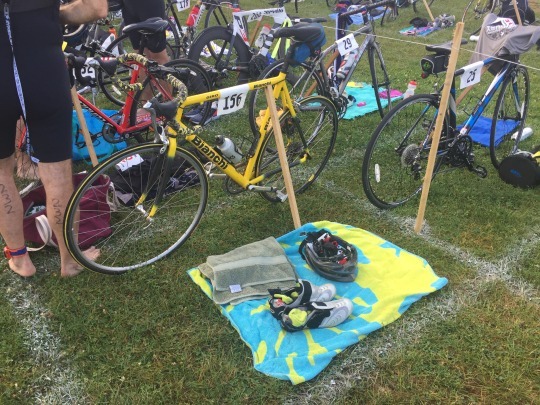 The second triathlon I had signed up for after my first was only two weeks away. It wasn’t originally supposed to work out this way; I had planned on doing one that was three weeks after the first. 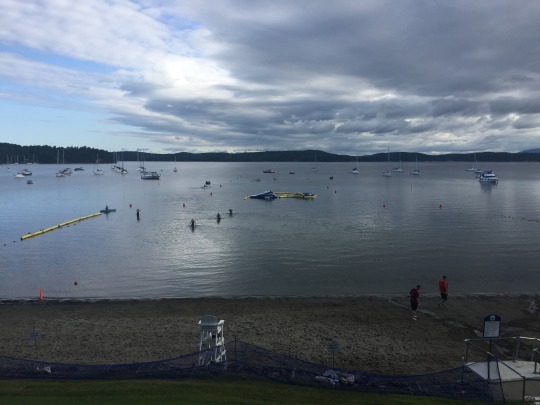 But that one got canceled (with an oddly passive-aggressive email from the organizer), so I went to my second choice for my second triathlon, which was scheduled one week sooner. My plan for bridging the two-week gap between the two events was to do one week of moderate workouts, followed by a week of light workouts. I guess the idea being that I would maintain one week and do sort of a taper the next. I wasn’t particularly worried about it, since I had proven to myself that completion shouldn’t be a problem. I did a couple of mountain bike rides, one of them with a friend I hadn’t seen for a long time, at a place that was new to me for riding. I also did two swims, about 20 minutes each, and a short run. I capped the first week off with a brick, which I was able to do as a scouting run for the third triathlon I had scheduled (more on that later). Overall I felt pretty good. Recovery didn’t seem to take too long, which didn’t surprise me. I had gone hard at my first tri, but in the end it was only about 1.5 hours long, so a couple of days at most to get back to feeling normal seemed about right. 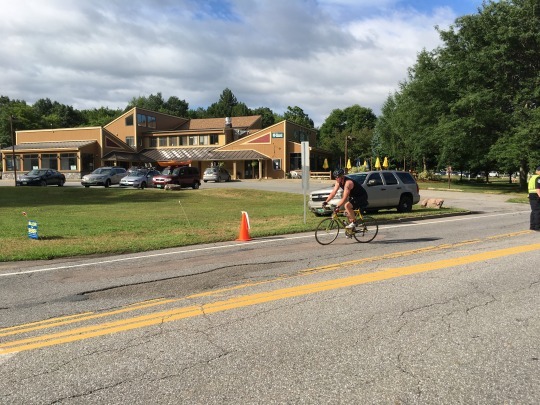 I finished my first sprint distance triathlon! Getting here was the culmination of 10 weeks of training, with a focus on changing my eating habits and trying to lose weight. It was a milestone I worked hard on, and I was proud to achieve it. It took the week beforehand off almost entirely, doing only an easy swim where I tried out a couple of techniques I had seen online. Other than that, I didn’t exercise at all. I knew I was really stretching the definition of “taper” but considering my recent calf injury, which had only just begun to feel normal again, I thought it was best to go the route of complete recovery. Certainly nothing I did in the week beforehand would make much a difference fitness-wise; it was up to the 10 weeks prior to see if that was up to snuff or not. I spent the day before the race in something of a haze of nerves and intermittent preparation. I ended up taking two separate naps by accident, and it took me probably 4-6 hours to actually get my kits together. Mentally, I was in a fog. Eventually I did manage to get things laid out, though, and then packed them up into two reusable grocery store shopping bags, for T1 and T2. On the left we’ve got tri suit, race-provided swim cap, sunscreen, goggles and earplugs, and race manual. 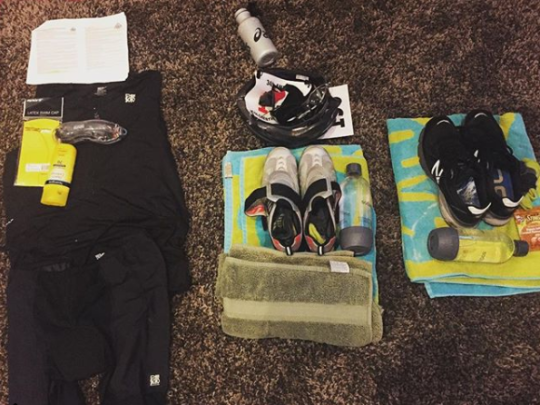 In the middle is T1 – spare bike bottle, helmet, gloves, numbers, bike shoes and socks, 2 towels and large water bottle. T2 has running shoes, an energy snack, another large water bottle and a towel. The race was about an hour from my house, so the wife and I were up early to get there. I had my usual breakfast of oatmeal, and hydrated on the drive. The weather was perfect, so I was glad to see that wasn’t a factor I’d have to contend with. The logistics of transition setup had me more nervous than almost anything else. The two transitions were in two different spots, as opposed to being in one location, and I didn’t really know how most people would be traveling from one to the other. Everything seemed roped off, so parking at T2 didn’t seem to be an option. Parking at T1 wasn’t an option either, for that matter; we had to park at a 3rd location and then walk (or ride) to the Ts. So we ended up walking pretty far, carrying my shopping bags, which almost immediately demonstrated how poorly chosen they were. Why it didn’t occur to me to use a backpack, or at least a duffel with a shoulder strap, I have no idea. The fog was pretty thick the day before, I guess. I got my stuff set up at T2, then headed to the beach for T1. After being handed my bike stake, I asked someone why people were leaving their bib numbers at T2 – because the race manual said you had to wear it on the bike. Did they get two numbers somehow, did I miss something? No, they said, they’re just not following the rules. Cool. At least I knew I wasn’t screwing something up. I got my T1 spot set up, then headed to the overlook just above the beach to check out the swim course. It looked to be a long way, standing on shore. It was hard to tell how it measured up to the training I had been doing. Only one way to find out, though. Due to how the timing mats worked, they had us all line up in a crowded mass on a pathway before entering the beach area, and once we were there, we weren’t allowed to leave. 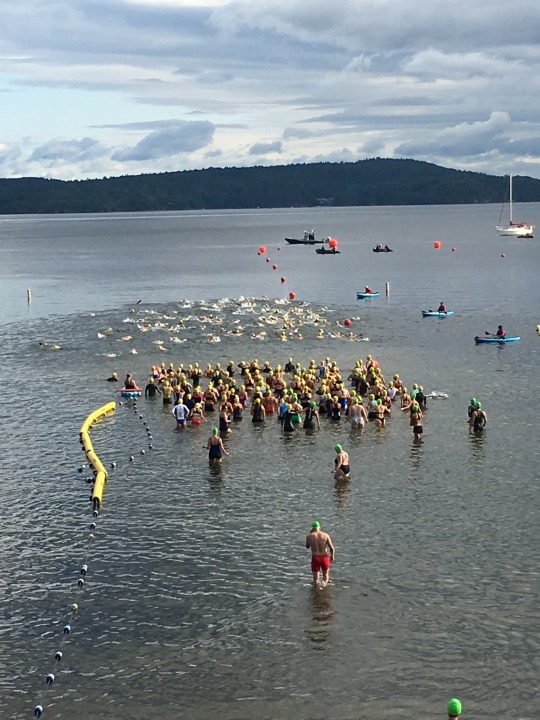 Due to the low water level, it was going to be a water start, so everyone waded out to a first set of buoys to await the start signal. The start was in two waves, with the men going first and the women and teams going second. I positioned myself to the outside and toward the back of the pack, thinking that would be safest and easiest to manage. I had never swum in a pack before so I had no idea what it was going to be like. I was just hoping I wouldn’t get panicky. The signal sounded and we were off. I took a few steps, plunged in, and almost immediately it was chaos. People were thrashing and kicking all around me. I got kicked and whacked several times right from the start. Because it mostly happened underwater, it didn’t really hurt, but it was always unexpected and somewhat disorienting. It was hard to find a route forward that wasn’t full of arms and legs. The pack didn’t really thin out until we had rounded the second corner and were on the way back toward the beach, so I probably only had about 40% of the course when I could really swim comfortably and try to find my own pace. The rest of the time was spent primarily fighting my way through and trying to navigate. The water was terrible, too – almost uncomfortably warm, full of weeds and smelling like boat fuel. Not the most pleasant environment to swim in. I ended up working pretty hard on the swim. By my watch, I was out of the water in about 10 minutes, not including the run up the beach, which was 3-5 minutes faster than I expected. I think I swam a lot faster than I had trained. It was over soon enough, though, and I was back on the beach, heading up for T1. As I ran up the hill, I discovered that one of my earplugs had suction-locked into my ear, and I couldn’t for the life of me get it out. There was nothing I could do but leave it in and do the rest of the race with one ear plugged. I hoped it wouldn’t affect my balance. 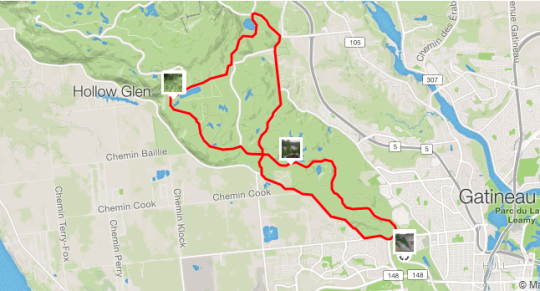 I dried my feet and got my biking gear on, then jogged my bike out to the mount line and headed out on the bike course. I wasn’t really paying much attention to the transition times, since this was my first triathlon. I primarily wanted to get through them successfully, so I didn’t mind taking a little extra time. As it turned out, I took a lot of extra time and had some of the slowest transitions of the entire field. Cycling is definitely my strongest discipline, and the course was pretty flat, so I was eager to put down a good time. 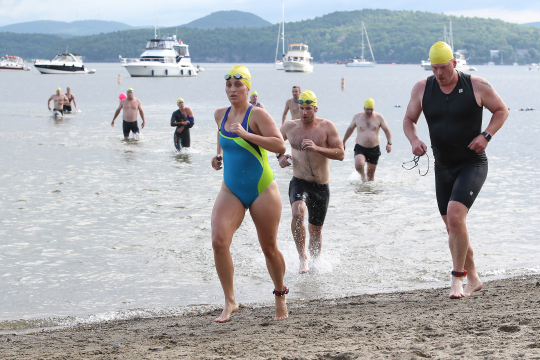 I realized right away that the effort I’d put out on the swim was definitely too much, because I was eating people up left and right in the first mile. That meant I could have swum a bit slower and made up time on the bike. Lesson learned. 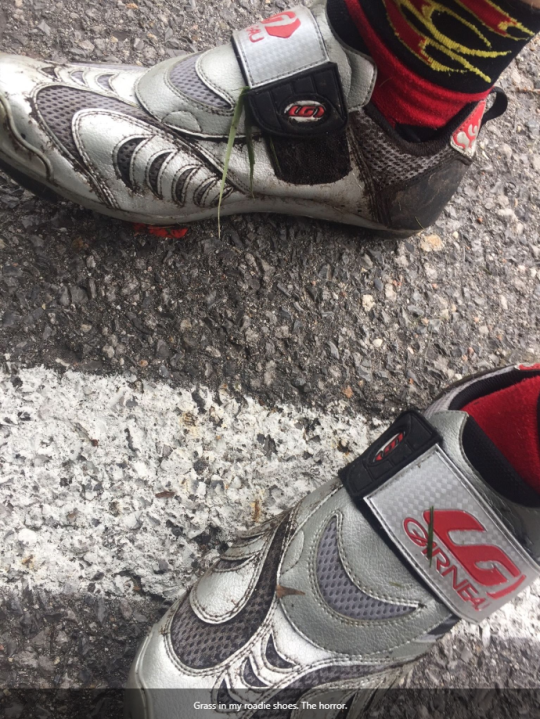 As I rounded a corner to head up one of the only hills, passing another cyclist on my right, I learned another hard lesson – never forget to check your tire pressure. Like, with a gauge. And a pump. My tire seemed to roll out from under me and go soft, and I was sure I’d blown a flat. I stopped at the top of the hill and got off my bike to check. My rear tire was soft, but it wasn’t flat. It was rideable, and I wasn’t about to take the time to pump air into it with my little hand pump. I decided to keep riding as far as I could. If it went flat on the course, so be it. For the time being, it was low but usable. The low tire definitely slowed me down. I couldn’t corner very well, for fear of losing stability, and whenever I tried to stand and power over small rises, the back end of the bike went all wobbly. It didn’t feel safe at all. I kept it conservative when maneuvering and put as much power in as I could when the road was straight. That got me to the end of the course with an average of about 19 mph. I found my transition spot easily enough and put my bike down. I basically ignored everything else there except for my running shoes. I carried one of my bike bottles with me for a short distance to douse myself with before tossing it to my wife, who was there cheering me on, then bricked on out to do the run. The legs felt dead and weird for the first mile, as expected, but my pace was good and my calf felt great. I felt the exertion in my lungs but I still had legs, so I pushed it pretty much as hard as I had left. The course wound through some residential areas and back along the lakeside, finishing up along a bike path. I came into the finish with an overall time of 01:21:34. I didn’t have a fixed goal to shoot for going into this; I was aiming just for completion. But under 1:30:00 seemed to be fairly respectable, and I was placed somewhere in the middle of the field, both in my age group and overall. The distances for the race were allegedly 500m in the water, 12 miles on the bike and 3 miles on the road (but I’m not sure I trust their measurements, either, particularly for the run). I say somewhere because the timing for this event was completely messed up and none of the splits ended up being reliable. The only time I trust from the official results is the overall. When I got home, I checked the results and saw one set of split times and placing; the next day, they had completely changed. Neither of them made any sense, either, and didn’t align anywhere close to what I had on my devices during the race. Luckily, the times didn’t matter all that much to me. This one was about learning how to do a triathlon, completing it and having a foundation for the next one. In terms of those goals, it was a complete success. 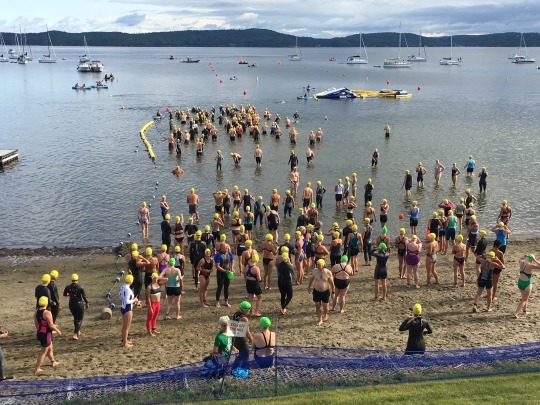 The biggest racing takeaway I got was that I don’t need to go that hard on the swim. I’m not such a good swimmer that it will make much difference, except to tire me out. Meanwhile, I’m much better at biking so I can easily make up the time on wheels. Logistically, the biggest lesson was to pare down my transition gear, to put it in a backpack and to not take so much stuff! I brought two giant water bottles I never even touched during the race, and I had way too many towels. I also didn’t need any food for such a relatively short race. I didn’t walk away with any medals, but I got a cool training shirt, some free food and a whole bunch of knowledge. It was a good day. It was time for another brick, the last opportunity before my first triathlon. 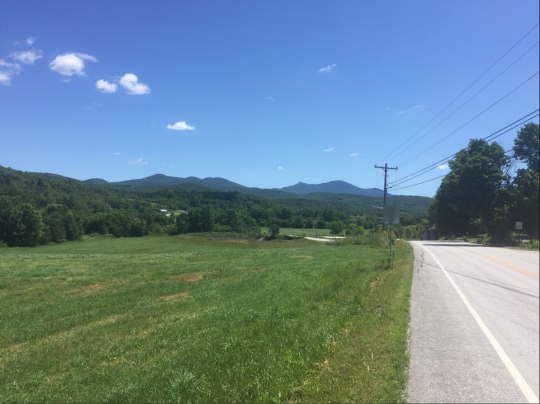 I decided to try to closely simulate the upcoming event, as well as ride out on the same route that foiled me earlier in the season, with a broken chain and a calf injury. This was what I needed to be confident that I could complete the race. The bike went according to plan. I took it relatively easy, not working too hard and focusing on keeping myself to about an 80% effort. One of the things I’d been concerned about was outpacing myself on the bike and having nothing left for the run, so I wanted to work on actively preventing that. The legs still felt terrible for the first mile of the run, but by this point I knew what to expect and it was easier to deal with. I felt no hint of a problem in my calf on the way out of the out-and-back route, but just after I looped around to head home, it seized up on me. It was bad enough that I had to stop completely. I tried to relax and calmly stretch it out, but I was cursing inside. I was terrified that this was going to be a re-injury that would prevent me from racing. Luckily, the stretching seemed to help quite a bit. I started running again, very slowly, to test it out. It held up. I continued and made it home ok, without further incident. I hoped it was a fluke. My first tri was just a week away. I have no data or elevation to show for this run, because my Fitbit Ionic failed in the middle of the run. Just straight up noped out on me. It was about par for the course on the day. Consistent exercise has done a lot of good for my state of mind. As someone who has clinical depression, I’ve always known that exercise is a benefit for people like me. Literally anyone who has ever had an interest in my well-being has heckled me about it. Particularly my mother. And I’ve always known they aren’t wrong. Doing anything about it is always a different story, though. Still, some days are more than the benefits of exercise (and medication) can surmount. At the end of the day, neither fixes the problem. A good run in the woods never hurts, though. I get some of the garbage out, and the problem sometimes seems a little smaller. As I ran past a river, half-lost and in grass and weeds up to my thighs, I spotted a doe. She stared at me as I ran by, silent and wary, unmoving. I watched her as she watched me, until neither of us could turn our heads any further. This was a fun ride. I took advantage of being on vacation, in a different area, to do a ride that was almost entirely flat. Better yet, it started on the side of a mountain – going down. I wanted to stretch out a bit to ride something longer than I had so far, and this was the perfect route to do it. 30 miles with basically no elevation wouldn’t overly tax my calf, but would let me get my heart rate up for longer than usual. It was a scenic place to ride, too, so all in all it was a good day on the bike. The true winner of the day was the swimming hole I got to jump in directly after the ride. There’s nothing quite like doing an extended cardio workout and then plunging into a clear mountain river. Because I do most of my swimming in an Endless Pool that doesn’t have an operating distance gauge, I don’t really know how far I swim. 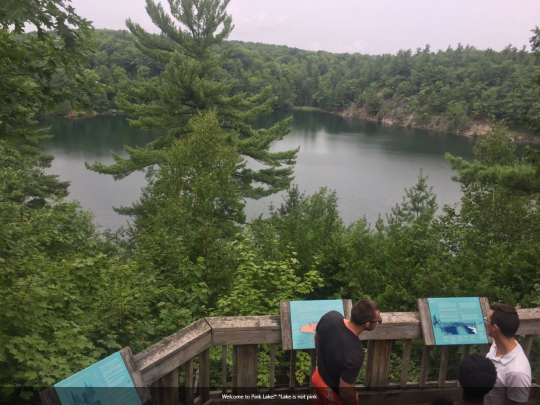 When I’ve done open water swims, I’ve estimated distance using Google Maps and the “round-about-there” method of marking out a real-life course. I researched some past results of the triathlons I plan to do and used those times as a reality check. While on vacation, we were at a place with access to an outdoor pool. I went down there one day for a swim and decided to try to calculate its length, using methods just as scientific as my other methods, namely: walking along the length and counting my footsteps and then guesstimating the total and converting it to meters. Seemed close enough for government work, as they say. The thing was, when I swam what I thought was 550 meters, it was over much sooner than I thought it would be. I figured some of that happened because I was able to push off the walls, which gave me an added bonus of speed without doing any work, but it was still a significant difference. So either I was way faster than I thought, or my distance calculations were off and it wasn’t anywhere close to how far I thought it was. Or maybe swimming in a pool just wasn’t anything like swimming in open water and the discrepancy was due to some other unknown variable. 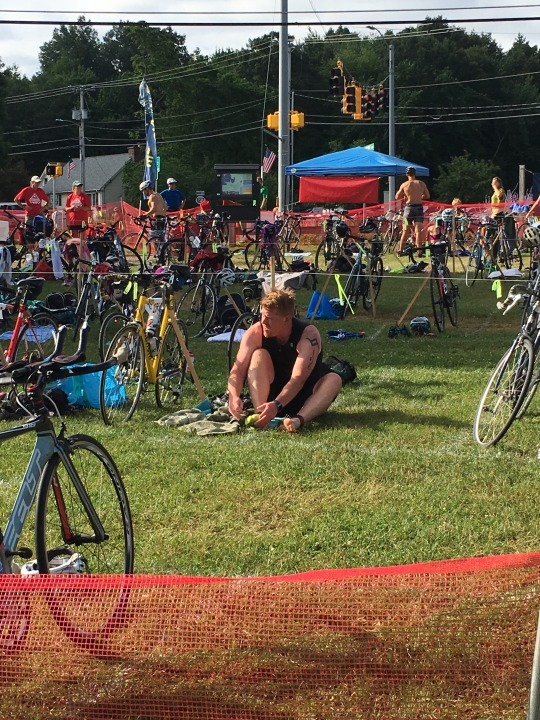 Combined with the state of my calf injury, it was another unknown that I was adding to a slowly growing stack, which would only ultimately be answered by actually doing a triathlon. The week of workouts after injuring my calf on my first brick was full of trepidation. 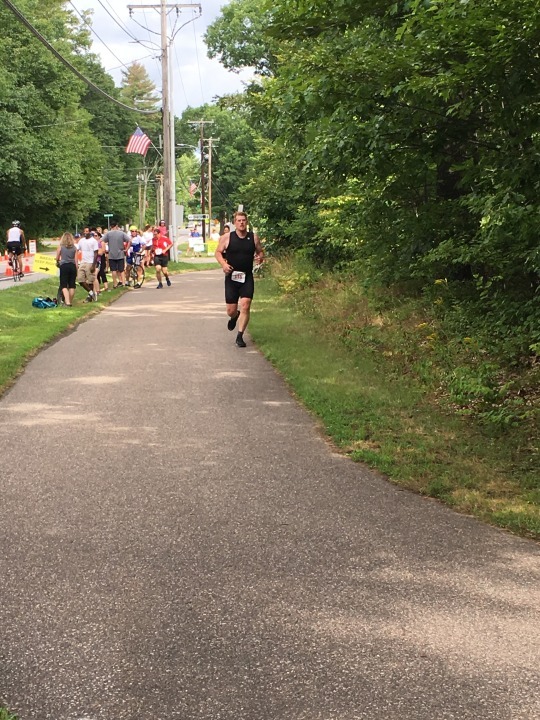 My first sprint triathlon event was just two weeks away, and I really had no idea whether I’d be able to recover enough in order to do it. I started the week with an open water swim at a local lake, my second time swimming there. I had a rough estimate of the distance I was covering from Google Maps, and corroborated that with the time I spent in the water. It was good practice for figuring out sight-lines and navigation in the water. My calf felt okay, but I didn’t expect that swimming would tax it particularly. The real test would be running. Next up was a ride, which I did as a relatively low-key mountain bike ride for just under an hour. No serious effects there either, but I did feel a couple of tweaks. It was mainly feeling painful during my everyday routine, preventing me from walking normally and feeling really tight and stiff. I felt like stiff was something I could deal with and potentially stretch out, but if it connected with pain, that was a problem. I took my first run of the week on the treadmill, keeping it flat and easy, for only about 20 minutes. It again didn’t seem to hurt it, but it wasn’t getting any better. Another easy swim, and then I decided to try it out on the road. I did an extremely careful, extremely slow run, with a couple of hills in it, one of which I walked. I didn’t want to take any chances with making it worse, but I did feel like something needed to be worked out for it to get better. That seemed to go okay, so the next day I did a decent ride, about 20 miles with about 1,300 ft of elevation, all in one go. It felt pretty good. I got my running shoes on immediately and went out for a short run, to complete my second brick. I didn’t feel normal, but I didn’t feel bad, and overall it was successful. I was optimistic for the coming week. Should I even bother with a 70.3? Maybe I should just go straight to full IM. I’m not a small person. Even if I was at my goal weight, which I’m definitely not, I would still be a large person. I’m 6′4″ and my weight, if I’m in shape and eating right, is naturally around 230 lbs. It’s tough to find things that fit me, particularly athletic clothes. After doing my first brick, in which I changed my clothes from a biking kit to a running kit, it became clear that I needed to get a tri suit. I already knew this was going to be part of the plan, but actually going through a transition really demonstrated it. It was pretty annoying to strip off sweaty, tight-fitting clothes and put on other clothes, not to mention the modesty aspects. And that wasn’t even after a swim. I definitely needed a kit I could wear for the entire race. Spotti Men’s Triathlon Tri Suit in size XXL. Had good reviews and seemed like a bargain. Unfortunately, it was a wedgie-fest. There was no way I could run or bike in something that was driving so far up my nether regions. I returned it. Next, I went for the Sparx X Triathlon Suit, which came in a XXXL size, no less. Surely that would have to fit me! …Nope. The same problem; all the extra X’s seemed to mean width, not height, and it just wasn’t going to work. Back went that tri suit too. I did some research. I knew there were lots of tall triathletes out there, professionals even, and they were getting their gear somewhere. I just had to find out where. (Local stores for trying things on isn’t really an option where I live). I came across a post on https://beginnertriathlete.com which pointed me to one particular manufacturer: De Soto. Some folks with my similar body type had had good luck with them. I checked them out. Their gear was more expensive, but definitely seemed high quality and if it fit, it seemed worth it. Plus, they had some tri shorts on sale. I went for it. I ordered directly from De Soto because their selection on Amazon was limited. I also decided to try a two-piece suit instead of a one-piece, on the advice I found in the Beginner Triathlete forum. Presumably that would help alleviate the wedgie issues. When it finally arrived, I apprehensively tried it on. The shorts were tight, but from what I had read, that was the way they were supposed to fit. They definitely gave me enough coverage. And the top was long enough that it went all the way down to my lower hips when I stood straight up. Looked like a winner at last! I was excited to try it out on my next brick. A key component of triathlon training is doing combination workouts, or “bricks” as they are called in the sport. These are training sessions where you essentially simulate one or more transitions, doing a ride and then immediately going for a run, for example, just as you would in an event. This was my first attempt at doing such a thing. I really wasn’t sure how it would go, since I’d never done it before, so I decided to keep both the bike and the run relatively easy. I’d shoot for around 10-12 miles on the bike and about 2.5 miles on the run, as flat as I could manage from my house. I felt really good on the bike, putting down the miles with relative ease and moving fairly comfortably. Things took a turn when I was close to the end, though. I came to an intersection in the middle of a hill and had to stop for traffic. Then as I started up again, preparing to tackle the rest of the hill ahead of me, my chain snapped. Like, literally just broke in two. I heard a snap, my legs started freewheeling and I looked down to see it just dangling off my chain ring. I was only a mile from home, so a rescue mission didn’t take long to reach me. It was frustrating, though, and dropped me out of the zone hard. I hurriedly changed into my running gear (no tri suit yet) and headed out on my run, eager to regain the momentum I had had going before the mechanical failure. My legs felt awful. I had never experienced anything like it. I’ve been tired on a run plenty of times, and having finished two marathons in the past, I know what it’s like to feel nearly 100% fatigue in your legs. But this was different. This was like my legs belonged to someone else and I was controlling them remotely, or something. It was really weird. They felt almost numb, even though I could feel them. It was clear very quickly why people practice this sort of thing. After about a mile, the weirdness started to clear up and I felt more like myself again. I crested a hill and started down the other side, when a car appeared heading toward me. I moved to the side of the gravel road, into the shoulder. And felt a twinge in my calf. Different than a cramp, it was like a very specific section of my calf contracted as hard as it could. I should have stopped immediately to stretch and rest, but I was determined to see this through and was locked into a mental race mode. The leg hurt for the rest of the run but I finished it out and limped up my driveway. I wasn’t sure how that was going to play out, but it didn’t look or feel good.